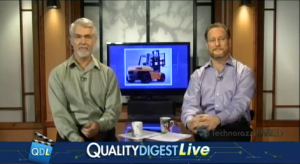 In late 2013 Quality Digest covered our training in their daily live manufacturing digest broadcast. You can still see that video through this link. 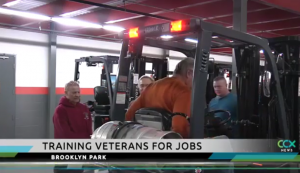 Our forklift training and certification for veterans can be seen at the 3:20 mark in the video. Quality Digest for thirty years has been bringing news and information to quality professionals. With more than 40,000 opted-in subscribers, they are the source for cutting-edge management, tools, and innovation in the field. You can find their website here, and you can also connect to them through Twitter at @QualityDigest and Facebook. More recently, local channel CCX Media visited Toyota Lift of Minnesota and our forklift trainer Steve Gerlach [also a veteran] during our recent veteran’s class. CCX stands for “Connected Community Experience”. CCX Media is a service of Northwest Community Television which has proudly served Brooklyn Center, Brooklyn Park, Crystal, Golden Valley, for over 30 years. During their visit, they witnessed veterans receiving training in the classroom and in the warehouse. A spokesperson for the company says it was a way TLM could give back to the people who have served. Please watch the video below. Lower turnover: U.S. Bank has found its retention rate 47 percent lower with veteran employees than with non-veterans. Higher aptitude: Xcel Energy has found 70 percent of vets pass its applicant aptitude tests, compared with 45 percent of non-vets. More reliability: EJ Ajax’s absentee rate is 7 percent lower for veterans than non-veterans, and the average veteran tardy rate is 39 minutes versus 62 minutes. Do you know a veteran who might be interested in this free service? Have them visit our website www.ToyotaEquipment.com and click on our Event Calendar link. Scroll through the months until you find the link to our next class date [not known at the time this article was published]. Or contact us through the form on the right and we will work with you directly. We look forward to another year of assisting veterans through this process in 2019. Forklift certification is just a small part of all the effort Toyota has done to benefit veterans, more on that in a moment. We would welcome the opportunity to cover your material handling questions or concerns. Toyota Lift of Minnesota works very hard to be your partner and material handling, consultant. You can also use our contact form seen to the right!